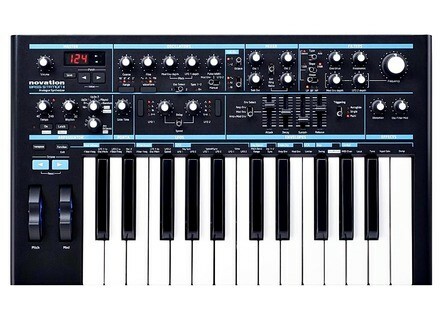 Introduced in Frankfurt last spring, the Bass Station II marks the return of Novation to the analog world. Let's find out if the brand was able to retain its know-how. Cf file test, all is said. The control layout is damn good, everything is easy. Additional functions accessible via the keyboard takes a little more time, some have been in direct control but I do not miss me too much either. The only thing I would really like to have more is a second envelope generator to play simultaneously and differently on the envelope modulation and amplitude (it is still possible to change the two together with four faders) and two separate control sections for both oscilloscope. To respond to the notice of Infracid: it is possible to listen to other presets when working on a patch, when you press save once and you must choose the preset number to overwrite it can listen by browsing. 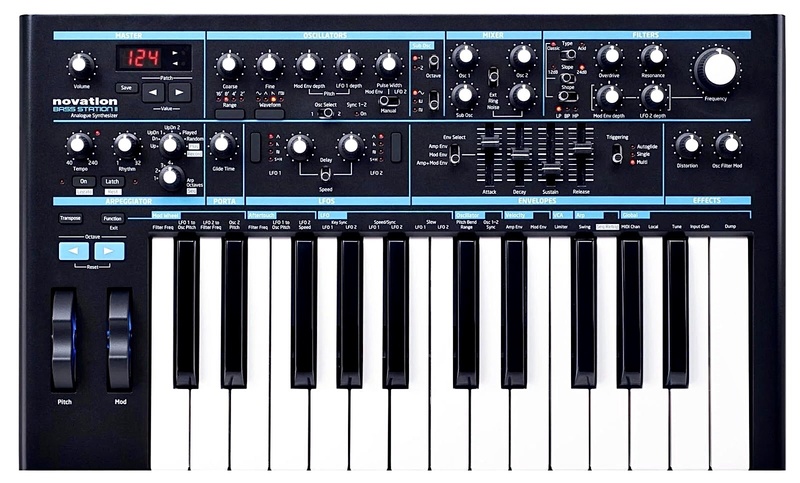 This is what decided me, I hesitated between MiniBrute and bass station, as this is my first synth, I have chosen for its versatility and the range of sound that seemed more 'large . The MiniBrute really appealed to me also because I love the sounds and aggressive side a button = function / no presets' the MiniBrute. Finally use I really appreciate the convenience of being able to recall a sound found in a good session and bass station is also known to be aggressive when pushed a little. Why I love the 'osc filter mod' that pushing the filter resonance and adding a bit of overdrive and distortion may come out well calibrated sound (not as extreme as MiniBrute though) or permit create modulations nice playing on the Tilt 2 very low notes. The ability to switch between the two filters is also a great advantage for me. I play a lot with for about a month. Store I also tested MiniBrute / microbrute (a good half hour each) and if I had the choice again I repeat the bass station, great sound, excellent value for money. Larron's review (This content has been automatically translated from French)" Great synth for the price!" Everything has been said in very good test above. The use is very simple once you understand the use of functions on the keys. The highlight of this machine: the sound! J have many old monophonic analog at home (MS20, Prodigy, TB303, etc ...) and I wanted a small modern simple and cheap to tour without taking my old capricious cuckoos monaural. J bought successively MOPHO (very advanced modulations but its pretty sterile and cold), a Minitaur (ultra limited to modulation and filtering >> wholesale level can be A good bass sound with, and c is, he did not keyboard and the system memory is very sketchy). I finally chose (some default initially) for this little light synth and not too expensive. Well I'm really happy. Can be both sound very similar to those of TB, of an MS20 and a Moog. It has a sequencer and an arpeggiator, 2 oscillators + sub give them a huge potato in the grave, and sound really analog (unlike the very civilized oscilloscope Mopho). The best machine in its class in my humble opinion! petitsynthe's review (This content has been automatically translated from French)" Compact and rich synth opportunities"
2 octaves: compact side for me is an advantage because I have many other keyboards and too much space: anyway, I can always control it with a MIDI keyboard with more octaves. - With regard to having to switch between the two oscillators to edit is not always convenient and it may quickly edit one wanting to edit the other, especially if we went in another section of synthesis between. - The fact that the preset one always returns to the ignition. Distortion, I do not use it because I generally love rather soft and muffled sounds, but for electro sounds very fashionable at the moment, it does. For cons, the overdrive on the filter gives a little more fishing and heat when used moderately. But as to the possibilities of synthesis very important, for me it is more a complementary synth (but I repeat, for me). In absolute terms, the fact that this is not a big sound is absolutely not annoying it regarding the FX or leads but may be for those who like "big" and bass ... even a synth like this is made to fit into a mix: do not forget that its too big is always difficult to place, in the case of BS2 it can even become an advantage! Any way to get a better idea, I can only advise you to go listen to it in a store, spend a good half hour, and possibly compare to other similar machines ( MiniBrute, microbute, mini-MS20, sub-phatty, etc ...). The value for money is excellent, like all the many new mono coming out on the market since Minibrute, but for the benefit of memories (although for some it is a disadvantage, go figure ... however, which can the more can do less, right?). To summarize, a really good little synth sound may be a little late but two assets are the memories and the rich sound editing capabilities. Toxikalien's review (This content has been automatically translated from French)" yum"
I me since August I drive uses the audio output of bass station on ableton for him paste a good distortion (trash2) and is nickel! what I love most: memorisation of preset, what I like least: the distortion, with experience I not really know if I would do this choice I would have to try the microbrut or minibrut to know! it is about to start a monophonic analog synth (one note at a time) with 3 oscillators, 2 LFOs, an ADSR filter and one for amplitude, you have 4 types of filters available, a filter : bpf, hpf and lpf all 12 or 24 pole filter and a 4th acid says it will only have the 24-pole filter lpf (I think) a configurable but not usable midi (maybe I n arpeggiator ''m not happened ...), super bonus plus an overdrive (similar to the overload of at MOOG) and a pretty cool distortion (this is not a SHERMAN or COOKIE but is glad she is Ia). all with 128 memories (all rewritable) and a keyboard key (not mini ) receiving velocity and after touch. last reproach, a button to compare the sound created in previous sound the same bank would have been welcome. then the sound is great for powerful lead (or not) in all genres, for bass is not bad but far from a Minitaur from home or even a moog little phatty, however the structure of the bass Station 2 offers many more possibilities than those mentioned above, the conventional analog sounds are brought to her as well as the more aggressive kind justice, mr oizo .... fx does not scare him either, so you can R2D2iffier through 2 lfo as you please. he sat next to me in a slim phatty, prophet 08, Minitaur, Machinedrum and the sound is quite compatible with these, from the point of view of safety and grain it has its place and has a blush of people. Finally I would say that is the best status price / quality ratio seems to me quite obvious and justified, 460 euro for three oscillators with four filters and distortion, rather honorable keyboard with velocity and aftertouch all with 128 mémoire.donc yes it is a case, as the first synth or a set already provided it find a place without a problem. to begin it comes to a monophonic synth (a note at a time) dot 3 oscillators, 2 LFOs, filter ADSR and one for amplitude, you have 4 types of filters at your disposal, a Filter: bpf; lpf and hpf all in 12 or 24 pole and 4th acid filter that says it does bnficiera as lpf filter 24 pole (I think), an arpeggiator paramtrable but not used midi (maybe I am not arrived ...), super bonus plus an overdrive (similar to the overload in MOOG) and a rather cool distortion (it's not a SHERMAN or BISCUIT but is glad that either). all with 128 memoirs (all rinscriptible) and a keyboard (not mini button ) receiving the vlocit and after touch. last reproach, t have a compare button welcome. then the sound is very good for powerful lead (or not) of all kinds, for bass is not bad but very far from a moog Minitaur home or even a little phatty, however the structure of the bass station 2 offers many more possibilities than cit above, the classic analog sounds has its harbor as well as its most aggressive type justice, mr oizo fx .... do not do it Fear not, so you can R2D2iffier as you please. he took me up to the cost of a slim phatty, prophet 08 Minitaur, Machinedrum and the sound is quite compatible with these, from the point of view of safe and grain it has its place and has a blush person. Finally I would say that is the best status report qualitprix seems to me quite justified and empty, 460 euro for three oscillators with 4 filters and distortion, keyboard rather honorable with vlocit and aftertouch all with 128 mmoire.donc yes it is a case, as the first synth or a set already well provided he finds a place without problem.